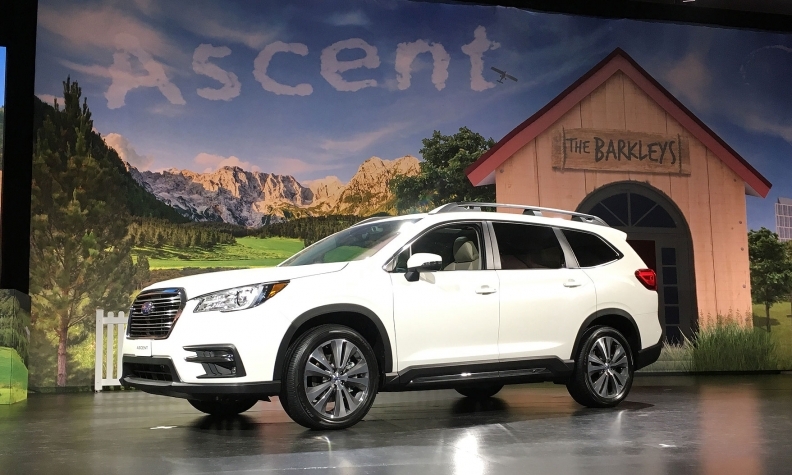 Ascent pricing was not released Tuesday but Subaru executives say it will start in the low $30,000s. LOS ANGELES -- Subaru is re-entering the market for big crossovers with three rows of seating -- a move that puts the brand in more direct competition with some of its bigger rivals. The all-new Ascent, unveiled here on the eve of the Los Angeles auto show, launches Subaru right back into the hotly contested three-row crossover segment, one the automaker has not been able to tap since output of the ill-fated Tribeca ended in 2014. “Subaru customers asked for a vehicle like Ascent and we listened,” Subaru Canada CEO Yasushi Enami said. It will compete directly with the Ford Explorer, Toyota Highlander, Chevrolet Traverse and Mazda CX-9. Pricing was not released. Subaru sold 45,927 vehicles in Canada through October, up 9.2 per cent from the year-earlier period, placing the automaker well on track to surpass last year's total of 50,190 total sales. The production model remains similar to the Ascent concept that was shown this year in New York. Subaru officials maintain that all-wheel drive, an 8.7-inch ground clearance and 72.6 cubic feet of cargo space will help Ascent appeal to Subaru customers' outdoorsy activities just as much as its smaller siblings. The Ascent is the first all-new Subaru model since the introduction of the then-XV Crosstrek. It will also come with an all-new powerplant: a turbocharged 2.4-litre boxer engine that produces 260 hp and 277 pound-feet of torque. It's paired with a new version of Subaru's continuously variable transmission. Fuel economy numbers were not released, but Subaru says the Ascent will be able to deliver 800 kilometres on one fill-up of the 73-litre tank. The Ascent, built on a modified version of Subaru's modular vehicle platform, will be available in either a seven- or an eight-seat configuration. While it’s available in four trims in the United States — base, Premium, Limited and Touring — trim selection in Canada will be different. In the United States, the base trim line comes with a standard bench seat in the second row, while second-row captain's chairs are a no-cost option on Premium and higher trims, Subaru said. Higher trim lines come with safety and technology features suited to appeal to families on road trips. Some of Subaru's EyeSight driver-assist technology, which has become an increasingly popular option among its current lineup, will be standard equipment across all trims on the Ascent. The driver-assist technology available on the Ascent includes automatic pre-collision braking, adaptive cruise control, lane-departure and sway warning and pre-collision throttle management. New to the safety technology lineup is EyeSight Assist Monitor, which Subaru says "provides a heads-up display of the EyeSight system warnings as well as system status information" on the windshield. A cabin-view mirror that allows the driver and front passenger to view occupants in the second and third rows is also standard. Standard tech goodies include a 6.5-inch multimedia touch screen with Android Auto and Apple CarPlay capability and four USB ports. Premium and higher trims also get an eight-inch touch screen. The top-of-the-line Touring trim comes with eight USB ports and a 120-volt power outlet. Ascent production will begin at Subaru's Lafayette, Ind., plant in the second quarter of 2018, and the first models are set to arrive at Canadian dealerships by early summer, the automaker says.